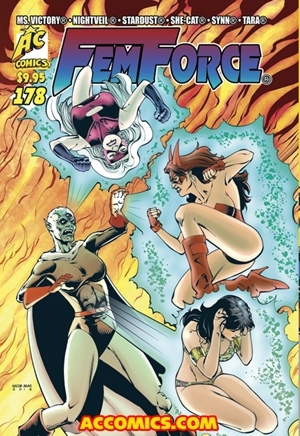 The latest stanza in the saga of The FEMFORCE-issue #178- is now available!! Last issue’s surprise encounter with GORGANA turns into a full-scale battle for the FF on the grounds of UCF, and the odds are stacked agains Ms. VICTORY, SYNN, TARA and SHE-CAT until guest-star FIREBEAM returns to full power to help tip the scales , in “Crystal Clear”, written by Stephanie Heike, with art by Rock Baker and Jeff Austin. Then, in a feature-length untold FEMFORCE story from the early 1990’s, SYNN ropes SHE-CAT into joining her as a model in a charity lingerie fashion show that turns dangerous in “Masks In Lace”, written and penciled by Rock Baker, and inked by Scott Shriver. Next, an FF story from a different perspective- told by an innocent bystander saved by the FEMFORCE- “Comment, Like And Share”, written by Andrew Hawnt, with art by new discovery Emanuel Derna. Rock Baker debuts a new concept this issue, in “SUPER-CUTIE: The Bare Facts”, a pin-up style tongue-in-cheek satire of the “good girl” art superheroine genre created, written and penciled by the talented Mr. Baker, with slick inking by Scott Shriver. Then, NIGHTVEIL has triumphed in her months-long struggle on Dark Dhagor, but in her moment of great triumph, she gets the biggest blow she could possibly imagine. At that point, what other option does she have but to return to Earth and the FF? “Welcome To My Nightmare”, written and inked by Mark Heike, with pencils by Dan Gorman. TARA FREMONT is called to Nottingham, England to help solve a pest problem in the basement laboratory below a centuries-old castle, only to find a menace too bizarre to have imagined beforehand, in “Beneath The Castle Grounds”, written by Andrew Hawnt, with art by Jacob Bear. Finally, RAD’s undercover work to break up the mysterious underground paramilitary group The Strong Hand hits a snag when an unexpected character from years gone by mistakes Jennifer Wayne-Burke for her mother, Joan Wayne in “Blast From The Past”, written by Stephanie Heike, with art by Dave Matsuoka and Scott Shriver. Seven all-new, never-before-seen FF stories totalling 80 pages of glamor, action, drama and excitement- that’s FF #178. Full color covers with black and white interiors, standard comic book size and saddle-stitched, for $9.95. Released in 2017.